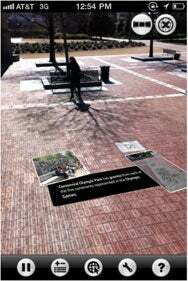 An iPhone version of the augmented reality Argon browser, which lets users scan places and objects with the phone’s video camera and see Web content overlaid on the screen, is now available. Argon for the iPhone, available now in a developer preview version, can be downloaded free from the Apple App Store. An Argon user standing in a city park can pan the iPhone video camera and see overlays of geo-tagged Flickr images, Twitter posts and other Web content that is relevant to whatever is being viewed, including information about businesses and products. Argon’s mobile architecture, called KHARMA, is based on open Web markup languages, like HTML5 and KML, so Web publishers can use standards-based programming technologies to create Argon applications. For the iPhone, this means that any content that can be rendered by its Mobile Safari Web browser can be surfaced via Argon, the Georgia Institute of Technology, which develops the browser with funding from Alcatel-Lucent, said on Tuesday. The Georgia Tech development team for Argon plans to port the browser to other mobile platforms, like Android. Argon taps into the trend of mobile applications that rely less on text input from users, and leverage user actions and device capabilities that are more natural to the mobile experience, such as location awareness and camera-based visual input.